Ah, do you remember this. 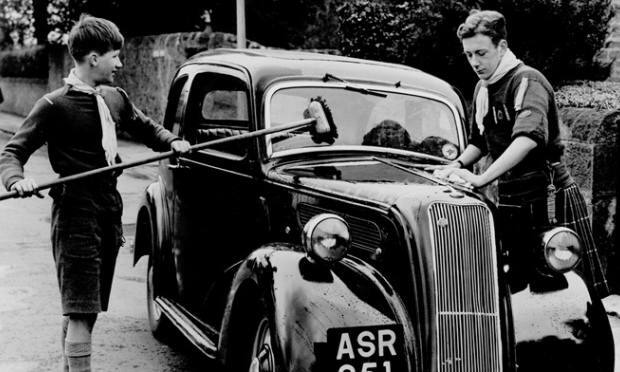 Scouts, Guides, Cubs and the like knocking on your door and asking if you had any jobs that you would be willing to let a ham-fisted youth do for a bob (1 Shilling or 5p in todays money). I was a fairly unenthusiastic bobber-jobber but I cleaned cars, washed windows, dug gardens, mowed lawns and all for a bob for charity! It was enjoyable in a sort of “do I have to this” kind of way. 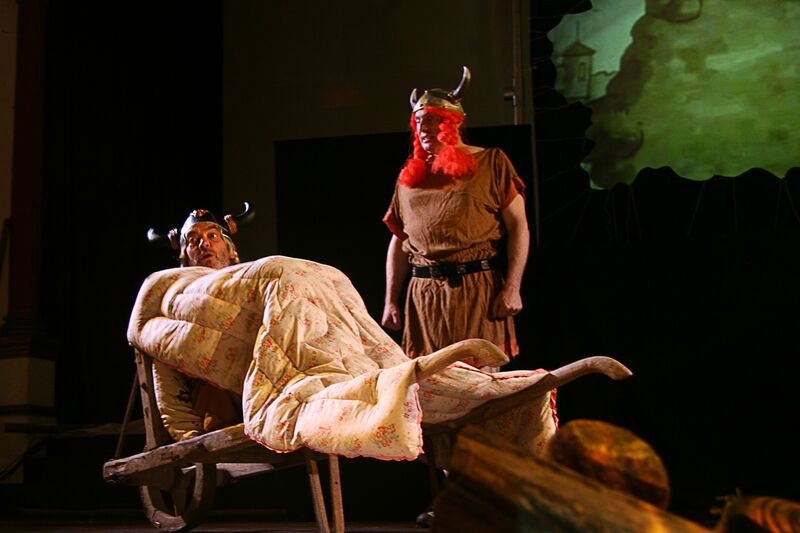 Well, The Sagas of Noggin the Nog, is off to the Edinburgh Festival. We are trying to raise money to enable Noggin to perform in front of new audiences, venue bookers, producers, theatre professionals and so on, at the biggest festival for performance in the world, as a means to achieve more with this “entrancing” family show next year; we want Noggin to be seen by many more people. So … and this is where our campaign differs from Bob a Job week … we are having a Bob-A-Nog week … where we ask you for money and in return (instead of us coming round and cleaning your lawn or mowing your car) we give you a warm feeling inside … and (oh, yes, there’s more) there are certain rewards that can be claimed … all you have to do is click on the link below which will take you through the ether to a new place. This new place is called Kickstarter … its a bit like Narnia only much more commercial and yet strangely heart warming … in this land of Kickstarter there is a campaign … and in this campaign there is a place where you can pledge anything from £1 to … the sky is always the limit in Kickstarter Land … for The Sagas of Noggin the Nog and … you can see what wonderful rewards there are. If you have clicked on the link, then you probably won’t be reading this paragraph because you will be in Kickstarter Land. If you haven’t clicked and you’re thinking should I do it, then the answer is yes … if you are STILL reading then you still haven’t clicked on it … you’re with me for the long haul. And it is a long haul! Oliver Postgate and Peter Firmin created Noggin the Nog back in 1959. I remember sitting and watching it on British television when I was nought but a mewling and milk puking sprog … it was in Black and White and was somewhat eerie … the music, the visuals and Oliver Postgate’s clipped accent making it feel somewhat other-worldly. Looking at it now it still has that strange, eccentric Englishness about it that intrigues and welcomes you in … it is gentle, humorous and quite different to todays wham-bam TV; the story-telling is compelling and simple but you want to know what is going to happen next. It was quite brave children’s television … the King, who you imagine might be one of the main characters, dies in the first few moments of the first episode and we are then introduced to Noggin, the King’s son … it is his tale we are about to follow. 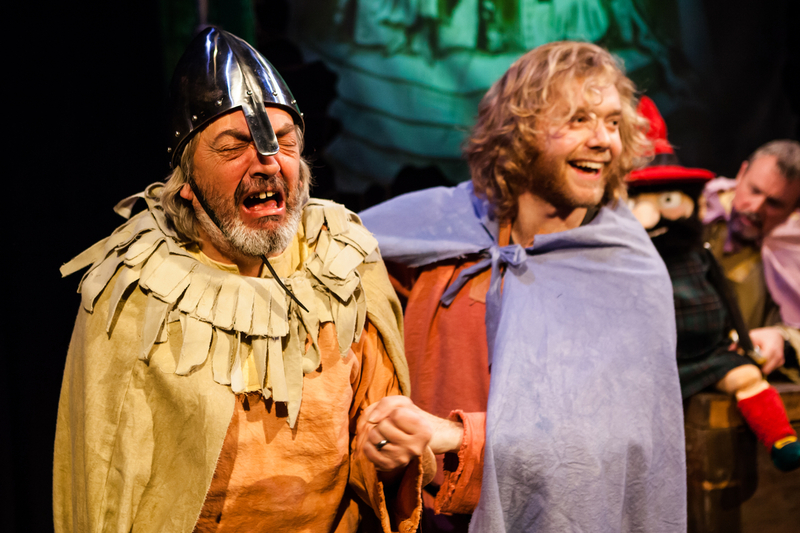 In order to be king, Noggin has to marry within six weeks, or the crown will go to his wicked Uncle, Nogbad the Bad. The stage (screen) is set for the tale to unfold. I won’t tell you what happens as that will spoil the story, though … in the second series, King Noggin, oops! … travels to the Hot Water Valley to help the little people who live there with a Dragon problem. 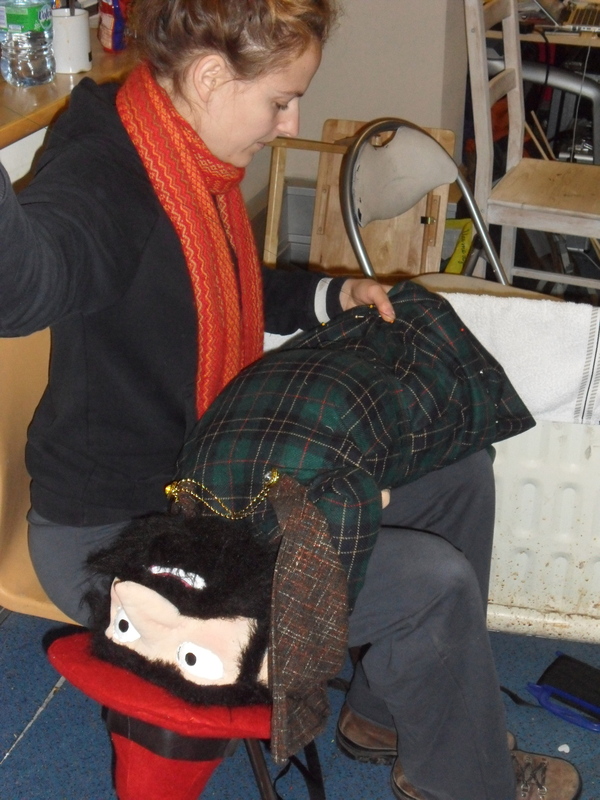 It is the first two series of Noggin the Nog that our play centres on. There are silly Vikings, live music, puppets and live projection taken from the original films. It is a family show. 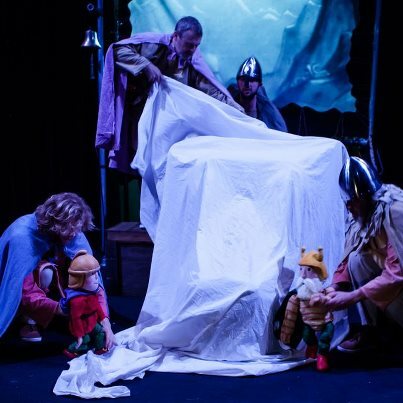 Children love it and adults love it, together they love it even more … last week we performed at Theatre Royal Margate. In the afternoon we had a large audience of school children who shouted quite loudly at Nogbad the Bad, in the evening we had more of a family audience … who booed and shouted very nicely at Nogbad the Bad and cheered when Noggin was successful. Both shows seemed to be enjoyed by all … perfect. This is us chatting to the audience after the show at Theatre Royal Margate! Anyway … if you are still here … why? Why aren’t you clicking on the link! I will attempt to update the blog regularly over the next five or six weeks … almost like an Edinburgh Festival Diary. We’ll see how I get on! The Theatre Royal Margate Performances! 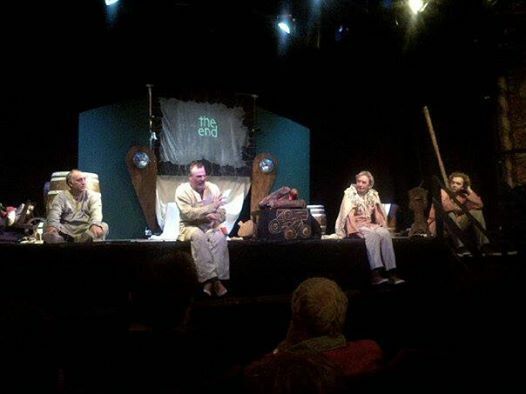 On Friday 11th July we performed our new Edinburgh version of Noggin at the Theatre Royal Margate. In fact, we performed it twice: once for three hundred children in the afternoon and once to the general public in the evening! I am pleased and excited to tell you … it works and people love it! Phew! At the end of the performances we sat and chatted to the audience; to ask if they enjoyed it, could we improve it, what bits didn’t they like and what bits they did … fortunately there were no “it was awful” quotes … in fact all that spoke seemed to have a good time and they wished us luck for its future! So, what is the future for The Sagas of Noggin the Nog? Well, first of all we have to get the play to Edinburgh; the Edinburgh Festival is the biggest shop window for performance in the world. And then we have to make sure that bookers, venue directors, producers and the like see the show. And then, next year, we will tour the play to venues in the UK and hopefully, abroad! In order to do all of that we have saved up our pennies for a long time but … and it is a big but … we are still quite a few pennies short of the carefully calculated budget. This is where you come in. If we ask you really nicely would you click on the “Support Us” link in the Blogroll, up a bit and to the right. This link will take you to our Kickstarter page where you can pledge any amount small or larger to enable us to take the play further. We know that money is really tight but if you have a bit of spare change we would be most appreciative. And see you next year at a venue near you! We are well into the second week of rehearsal now and fun has been had by all (and a lot of hard work, obviously). We’re almost ready! Honest! Just a few bits and pieces left to do, that’s all. We’ve cut almost twenty-five minutes from the show and brought the second half of the play more in line with the first half and it feels really great. We’re very excited about it. The proof, of course, is in the “performing it in front of nearly three hundred children on Friday”. Apart from rewriting sections of the play, re-assigning some of the lines (which makes them quite tricky to remember, I can tell you), changing the emphasis of some of the sections and generally rehearsing the whole lot, there were quite a lot of other jobs to be done. Some more surprising than others. For instance: poor old King Knut had a leg problem; in fact, two leg problems … they dropped off. A similar plight afflicted the Brave and Mighty ThorNogson. They have now been re-legged, phew! Tony has spent many “happy” hours re-editing and re-aligning all of the video projections … gosh, he enjoyed that! Max spent a good hour or so polishing his helmet … well, all of the helmets, actually, with wet and dry … and a shield. Nick clickety-clacked away on the laptop putting all the re-writes into a new document so that we could all sing off the same hymn sheet. I’ve repaired Ronf’s sword and both of his arms … much glue, gaffer tape and a few choice words. And this evening Tony and I enjoyed remaking and repainting a major part of the set. … two men dangle a barrel in the sea. Barrels dry out unless they have fluid inside them and this one has neither a top nor a bottom … it is very dry. It fell apart. We came up with this idea! Why not soak it in the sea! It worked, though it is very sandy and we did amuse a a couple of fishermen. All in a days work!